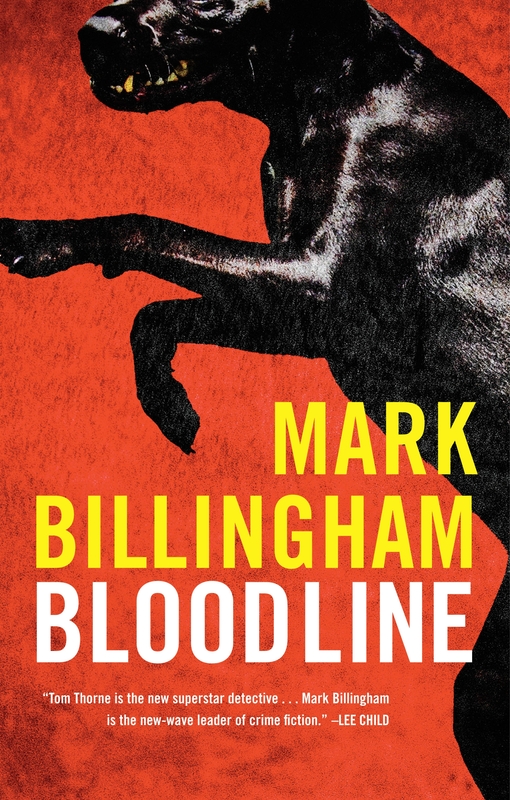 This week we salute BLOODLINE by Mark Billingham as it hits bookstores in paperback. The New York Times Book Review raved that BLOODLINE offers a “psychologically twisted and strikingly original plot” with a “relentlessly swift pace and high emotional pitch.” Here, we present Part I of a conversation with Lee Child, the #1 bestselling author of the Jack Reacher series. And don’t miss the newest Tom Thorne novel THE DEMANDS, now available in bookstore everywhere. Mark Billingham: I was thinking a lot about series and the demands that writing a series makes on you and the benefits of it. Obviously in the last week or so there has been heaps of internet chat in response to the rumor that Tom Cruise might be about to play Jack Reacher. Whatever your thoughts are about that, it’s an incredible testament to the power of the series and the ownership readers feel they have of the character. Do you feel that Reacher is yours? Do you feel like you share him? Lee Child: That’s a great point and it’s something I’ve been very aware of as the years have passed because it’s completely a progression, obviously. On Day 1, nobody in the world knows anything about Reacher apart from me because it’s the first book. It’s a work in progress, it’s not finished, and nobody has seen it. Then, the first book gets published and then the second and the third. And gradually the ownership of the character does migrate outwards into the public realm. I was very aware actually of the particular point which was after eight or nine books, maybe ten books. Previously to that people were kind of deferential. They thought Reacher was an independent entity, but they knew somehow he belonged to me. Then, after about the tenth book, he became totally publicly owned to the point where I now get abused just like any other fan with a different opinion. I count for nothing anymore. Reacher is completely independent and completely out there. And you’re right, the casting choice in Hollywood is being made right now. My attitude towards that was whoever is cast, whoever it was, 99% of the fans would be outraged because it would be a sheer coincidence if whoever it was matched their own personal image. I think it’s just proof actually of how tightly owned a series character becomes by the readers, which is great really because that is the advantage of a series. This is a tough trade. Launching one book every year is a new mountain to climb every time and if you can get any help at all carried over from previous years you need it. Of course, one of the great helps is, if it is a series, (to borrow the language of credit card companies) the new book is kind of “pre-approved.” The readership thinks, “Well, I liked the last six, so I’ll probably like this.” It’s a much lower hurdle to get over. I think with people who write standalone books, the author’s name obviously continues and counts for something, but you’ve got a slightly higher mountain to climb. Are they going to like it? Is it the same as what you’ve done before? You’ve mixed it, haven’t you? How have you felt about that? This week we salute BLOODLINE by Mark Billingham as it hits bookstores. TheReviewBroads.com rave that “BLOODLINE by Mark Billingham provides the best serial killer punch since THE SILENCE OF THE LAMBS.” Here, we present Part II of Mark’s conversation with Lee Child, the #1 bestselling author of the Jack Reacher series. If you missed Part I, read it first. MB: I think a lot of writers make a mistake – even if they do see a character that is going to have a decent shelf life – by laying it all out there in book one. By saying, this is who this person is. This is where he goes to school. This is what he has for dinner. This is who his family are. I remember making the decision that I wouldn’t do any of that, that I was not going to have this dossier of facts and figures. That I would simply try to peel away a different layer of the onion with each book and see what happened, so that the reader knew as much about Thorne, book on book, as I did. I’m not even sure that in the first book he was even the main character actually. He had the most amount of ‘onstage’ time if you like, but the character I got all the reaction about in that first book was the victim, actually. LC: Let’s mention what a great first book that was. Your first book was just tremendous. A fantastic first book. Sky1 is airing a series of shows based on Mark Billingham’s Detective Thorne books. Mulholland Books will publish a Detective Thorne novel by Mark Billingham, Bloodline, in July 2011. To learn more about the television series visit the mini-site or download the mobile app. I don’t do appointment TV. I used to, when there were fewer channels, fewer commitments, fewer mouths to feed….Woe betide anybody who stood between me and Steve Austin when I was a kid in the 1970s. I was addicted to Cracker back in the late 1990s. Towards the end of that decade, became something of a TV addict by default while working as a reviewer for Time Out magazine. More recently I was glued to the screen for the excellent, underrated series The Cops, which lasted a mere two series, and the superb Red Riding adaptations, as well as Five Daughters, the draining, but brilliant, exploration of the destruction Ipswich serial killer Steve Wright wreaked on the families of the women he killed. But these days I’m filling up the hard disk with recordings I’ll never get around to watching. I’ve got stuff on there from before last Christmas….I’d rather read, or watch a film, or play football with the munchkins. That changed with Thorne: Sleepyhead, adapted from Mark Billingham’s extraordinary debut thriller. It’s one of those packages in which pretty much everything comes off. There are a lot of police procedural dramas out there. Plain-clothed rogues battling against the clock or glacial, grizzling Scandinavian detectives. Serial killers. Phantoms from the past. Monsters in everyday clothing. But what makes Thorne stand out is the pace, the acting and the classy directing from Stephen Hopkins, who kept Jack Bauer on his toes in 24. David Morrissey plays DI Tom Thorne, and just a few minutes in, like Rathbone’s Holmes or Connery’s Bond, it’s difficult to imagine another face in the role. He’s the first person we see, huffing and puffing as he chases down a felon. His quarry runs into a house in a desperate bid to escape…and trips over a corpse lying on the kitchen floor. So begins this nightmare, which is at times exhilarating, unbearably tense, and truly frightening.